There are currently six game modes. In each, the way to win is different, and the game mode can influences your tactics and methods greatly. 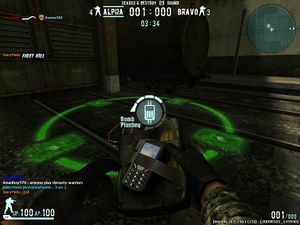 Four of the modes are team-based, meaning that the players are sorted into Alpha and Bravo teams, and one of those teams will win the game. The other two modes are not team-based. 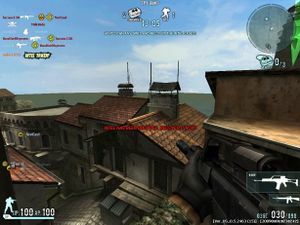 The Fireteam mode, which is Nexon America's version of Nexon Korea's Scenario mode, is set to be released on May 27, 2009. Elimination is a very popular and simple game mode. Alpha Team and Bravo Team will try to kill each other's members as many times as possible. Each time a person kills a member of the other team, that team gets a point. The person that got killed will respawn at one of their team's spawn points. The two team's spawn points will be at opposite ends of the map or far from each other. Large maps will have multiple spawn points for both teams. Both maximizing kills and minimizing deaths are important to win a game of Elimination. Even if someone made 60 of his team's kills, which is quite a lot, it isn't very helpful if he also died 80 times. When the set number of points is reached by a team, they win. Committing suicide or killing your own team (if friendly fire is on) will give the other team a point. The goal can be set to 30, 40, 50, 60...kills etc, all the way to 140 kills. Elimination can be played on every map (excluding Fireteam maps). In Capture the Flag, each team has a flag (red flag for Alpha, blue flag for Bravo) that the other team will try to capture and bring back to their flag. If this is successfully done, the team that captured their opponent's flag gets one point. Each team only has one spawn point, which will always be located near that team's flag. To take the opponent's flag, you simply walk over it to take it. The point is scored when you touch base at your own flag. If the opposing team takes your flag, you can get it back to your base by "recovering" your flag. You must first kill the person who has your flag. The flag will then be dropped on the ground. To recover, run and touch the flag, and it will be immediately returned your base. However, the enemy can also "re-capture" your flag if you are killed before you can touch and recover it. A flag that sits on the ground in non-possession will be automatically recovered in 30 seconds, if it is not recovered by a person or re-captured by the enemy. Also, if the flag-bearer commits suicide, the flag is automatically recovered. This person has the other team's flag. He is just about to make a touchdown by bringing it to Alpha Team's base. He also runs while carrying a grenade to increase his speed. A touchdown cannot be scored if the opponent also has your flag. When both teams are in possession of the other team's flag, a "recovery war" is initiated, in which both teams will be trying to recover their flag so that their team can score a point. During this time, both flag-bearers will likely be hiding at their respective opposite ends of the map. Some people will be protecting the flag bearers, while the other people will rush to the other side and try to recover their flag. Once one team recovers their flag, that team can touch base and score the point. The position flag-bearers is revealed to everybody by a nametag and a small picture of a flag beside it. Besides doing flag-related work however, anybody on one team can kill anybody on the other team, regardless of flag status. People who are killed always respawn at their base near their flag. The game of Capture the Flag is over when one of the teams scores the set number of points, which can be 3, 5, or 7 flag captures. It can be played on every map, except for Overdose( a Quarantine only map). There is also a time-limit that varies with the set goal. If the goal is not reached by any team before the time-limit is up, the team with more flag captures wins the game. In the case of a tie in flag captures, the team with more recovers wins. Search and Destroy is the most complicated game mode to understand, but it is actually not hard. There are two bomb sites, called Site A and Site B, shown by a green glowing circle on the ground. Alpha Team will always be the offensive team, and can choose to plant the bomb at either site. To plant the bomb, go to one of the bomb sites, press 6 to take it out, and hold the left mouse button. 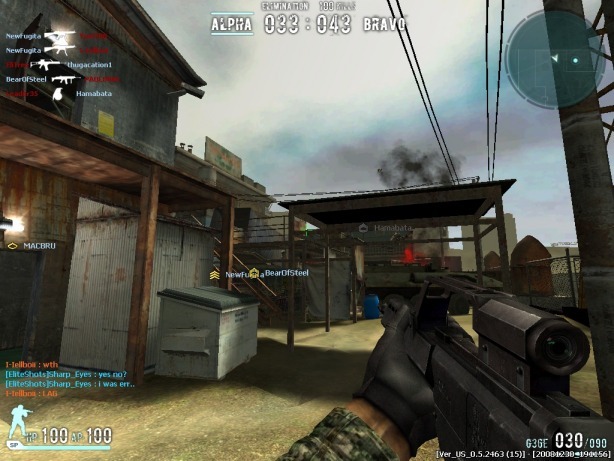 A circle of bars will appear and light up as you hold the mouse button, when all the bars are full the bomb is planted. If the bomb is not defused in 60 seconds, it will detonate and Alpha Team wins the round. Planting a bomb. The top of the screen will also show the number of players alive on each team. Bravo Team will always be the defensive team. If the bomb is planted, you can defuse it by finding the bomb, aiming your crosshair at it, and holding E. The circle of bars will begin to disappear, and the bomb will be defused when all the bars are gone. This takes around six seconds, so if the bomb timer (which is shown at the top of everybody's screen once the bomb is planted) is already under six seconds before somebody starts to defuse it, Alpha Team wins. If the bomb is successfully defused, Bravo Team immediately wins that round. In Search and Destroy, people on each team can kill people on the other team in order to prevent bombs from being planted or defused, but anybody who dies will NOT respawn for that round. Instead, dead people will view the actions of their still-surviving team members, and choose which survivor to view by tapping the spacebar. The dead members can thus provide their surviving team members with advice or warnings by chatting. If everybody on one team dies before the bomb is planted, the other team automatically wins. If the bomb is planted, and everybody on Alpha Team is killed, Bravo Team still has to defuse the bomb. The round ends when a bomb is detonated, a bomb is defused, or one team is completely wiped out. The game ends when one of the teams wins the specified number of rounds, which can be set to 3, 5, 7, or 9. Search and Destroy can only be played on all maps,except for Overdose. One Man Army is the most straightforward game mode. There are no teams, it is just everyone versus everybody in a fast and bloody free-for-all. Spawn points are scattered at intervals all around the map, so camping is nearly impossible because you never know where or when people might spawn. Your own kills and deaths are displayed at the top of the screen. Once somebody reaches the set number of kills, which is either 30, 35, 40, or 45, that person wins and everybody else loses. One Man Army can be played in all (Except specially made Overdose and Desert Thunder) maps. The game of Spy Hunt consists of two phases. In the first phase, the game starts out with five cases of "Intel" on the map and placed randomly. To take the Intel, you simply need to walk over it. Once you are in possession of Intel, you are a "spy", and everybody else will be trying to kill you to take your Intel and become a spy themselves. Spies can kill other spies to take their Intel. As a spy, the location of any other spies will be revealed to you by a nametag. Once one spy is in possession of all five Intel, the game enters the second phase. When you pick up a Intel case, it refills your ammo, health, and armor. Spies also have faster movement speeds and greater damage resistance to compensate. Also, spies have their location defined by their name highlighted in the same fashion as the flag bearer in Capture the Flag. The game enters the second phase when the numbers at the top become 0 and 1. Because the Super Spy's new arsenal is so deadly, it requires the work of everyone else to kill him. The Super Spy wins the game by successfully transmitting the Intel or the opposing team is eliminated. Everybody else wins if the Super Spy is killed, or commits suicide. Nobody wins if the time limit is up and both teams have survived. Also note that the Intel Transmitter doesn't appear immediately when the second phase starts. It falls from the sky after about 10 seconds, and anybody standing right on the landing area is crushed and killed. Spy Hunt can be played in Snow Valley, Two Towers, Gray Hammer, Warhead, Waverider, Power Surge and Sand Hog. The Snowball Cannon, Ice Rifle, and Snow Grenade Launcher all shoot projectiles that are affected by gravity, and therefore a bit of physics are involved. To get the projectile to fly the farthest, aim up and right-click at a forty-five degree angle. Each weapon has two firing modes. For the Snowball Cannon, Ice Ball Rifle, and Snow Grenade Launcher, a left-click will fire a short range shot and right-click will produce a longer range shot. 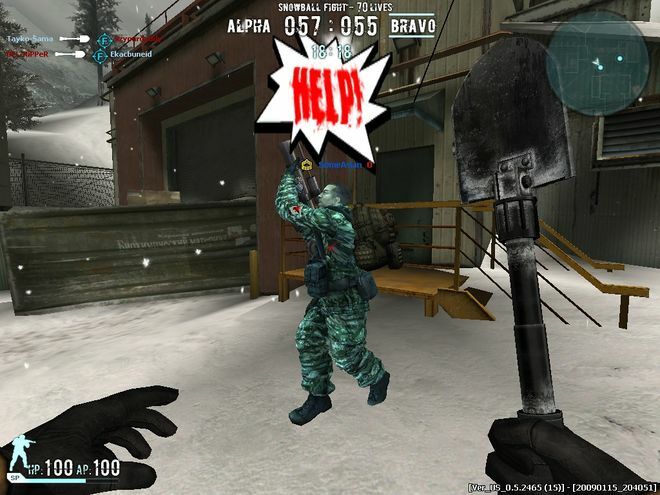 The Snow Shovel's left- and right-click attacks are identical to the GI Shovel, available for rent in the Melee shop. The left-click produces a quick swipe, while the right-click results in a longer range, and hits the target 2 times if aimed correctly (resulting in a 1 hit kill in most situations). 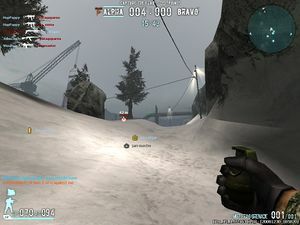 The point of Snowball Fight is to kill members of the other team, but using the Snowball Cannon, Ice Rifle, or Grenade can only reduce HP to 1. The person is then frozen in place. To actually make the kill, you must smash a frozen enemy with the Snow Shovel. Doing so is called "Ice Crush" and you get the kill. The Snowball Cannon launches a basic snowball that freezes the enemy after several shots. The Ice Rifle is basically the same thing, but a cloud of frost will linger at the point of impact, causing periodic damage to people who step within (just like a Incendiary or Gas grenade). The Snow Grenade takes several seconds to explode, and can potentially freeze many enemies at the same time. You can also defrost a frozen teammate by hitting them with your shovel. Doing so will immediately revive them and earns you a mission point. It is impossible to kill your teammates in Snowball Fight. Although you can freeze them, hitting them with your shovel will only un-freeze them. Also, anyone who gets frozen will automatically defrost in 10 seconds if nobody hits them with a shovel. In Snowball Fight, each team has a "respawn pool" that can be set at 30, 50, 70, or 90. Each time somebody is ice-crushed and respawns, the respawn pool is decreased by 1. When a team's respawn pool reaches 0, people on that team who die will remain dead. Whoever wipes out the other team wins the game. In the case that the time runs out, the team with more respawns left wins. This game mode was subject to a power-leveling exploit, which was remedied 2 weeks before the game mode was officially closed. Nearly all power-levelers identified were demoted and stripped of their NX, GP, Gear, EXP, and Rank (demotion back to trainee). For more details on fireteams, see the Fireteam page. This mode is unique in Combat Arms for the fact that it pits a team of up to 8 human players against a team of A.I. controlled bots. It is a multi-staged mission that involves a hostage rescue. 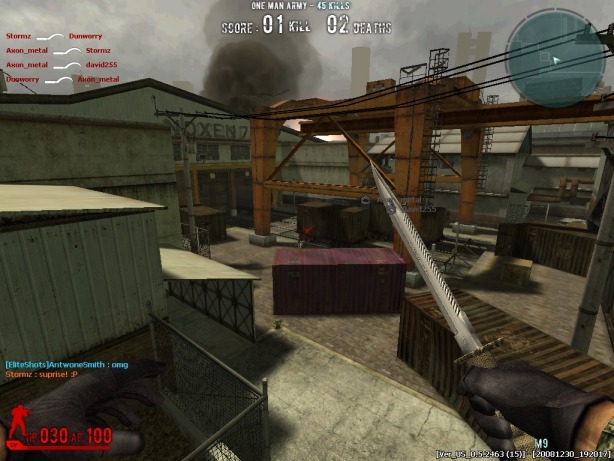 Players spawn with no extra lives, and are healed by reaching the next "checkpoint" or phase of the mission. Players can pick up ammo and health throughout the stage. The only known map that can be played on this mode is an enlarged version of Sand Hog called Desert Thunder. Enemies in Fireteam Mode include regular scouts (which have very low amounts of health but come in large mobs, at some areas they may respawn indefinitely), the Sand Hog Royal Guards (significantly more dangerous than the scouts), and other dangers such as grenades, lasers, explosions, and armored tanks. If one dies in Fireteam Mode, they will not respawn until the stage/checkpoint is cleared by at least one teammate. As soon as this happens, everybody respawns with full health and ammo for the next round. If everybody dies, the mission is failed and the game ends. Fireteam Mode is significantly different from the other game modes. One will almost certainly do poorly until he or she gains knowledge of the scenario process. Hard: The head cover that the scouts wear. Extreme: The head cover that royal guards wear. 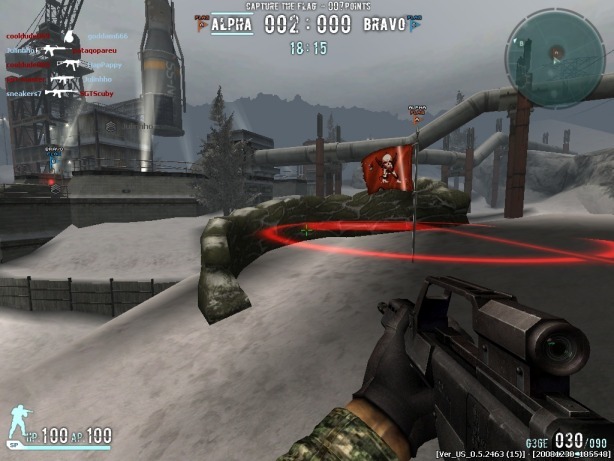 A unique mode in Combat Arms that allows you to use "points" earned by killing other players or completing objectives to hire AI-controlled mercenaries for your deployment. At the moment, there is only one Hired Guns map: "Operation: Blood Money" where you're robbing a NEMEXIS bank to attempt to stop them from being able to make the Infection Virus; but NEMEXIS has heard of this plan, and has sent in their own team of mercenaries to take the money to stop UAF from doing so. This page was last edited on 6 June 2015, at 11:16.